Another one of my Christmas cookies. 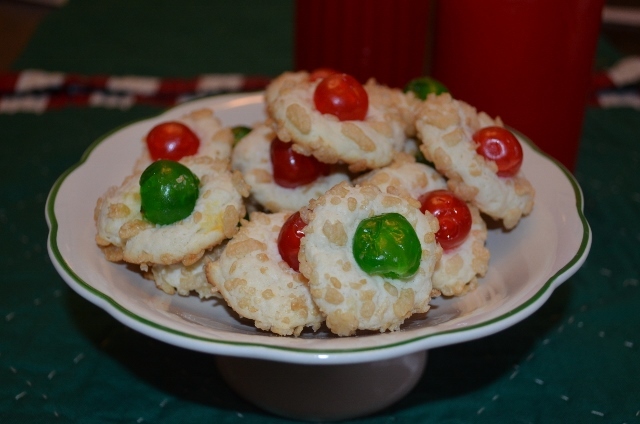 The cream cheese makes a very delicate cookie with a hint of almond flavor and I love the green and red candied cherries – looks wonderful on your cookie tray. 1. Cream together butter, cream cheese, sugar and almond extract until light. 2. Sift together flour, baking powder, and salt; stir into butter mixture just until combined. Chill 1 to 2 hours. 3. Shape into balls; roll in cereal and place on ungreased cookie sheet (or parchment paper lined sheet). Top each with a cherry. 4. Bake in 350 degree oven for 10 – 12 minutes . Cool on rack. Makes 4 dozen.